The newest bullet camera from our Alliance series is called a QUAD camera because it is capable of working with four different technologies. This versatile camera works with HD-CVI, HD-TVI, Analog and AHD and we think that it will quickly become one of your favorite cameras. 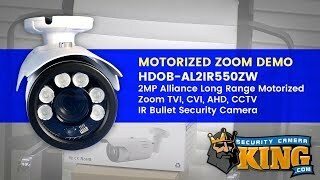 You’ll get a 2MP/1080p camera that delivers beautiful, high resolution video that you need to help keep your home or business safe. It has a top quality 1/2.8 inch 2.4 Megapixel SONY CMOS sensor that helps to process all of those pixels into a crystal clear video. With an IP66 rating, you can be confident using it inside or outside and it’s capable of working in a variety of climates. When you need a camera that is capable of seeing detail, this camera meets all the requirements for a long range camera. This has a 5-50mm motorized zoom lens and if you talk long range, that’s 10X! Imagine what you’ll be able to see with a 10X optical zoom and that doesn’t even take the ability to zoom digitally into consideration. It’s actually one of our favorite cameras to use as a license plate camera because of the zoom and the IR capabilities. With the built-in LEDs, this camera emits enough IR (Infrared) light that you can see up to 300 feet away in low light and total darkness. 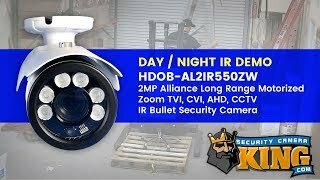 Since the technologies that these cameras work with all transmit over a coaxial cable and they only need a standard 12V DC power supply, it will be easy to replace your cameras and add these to your existing security system. Use the handy dipswitch on the cameras pigtail to switch between the different technologies. As with all of our cameras and recorders, you don’t have to pay extra for things that should be included! What that means to you is that you’ll get a 1 year warranty, FREE US based tech support, and FREE remote monitoring software. Bought this camera for use in a theater so the back stage crew can watch what is going on, on the stage. Has great night vision. The zoom was great as well. The camera was mounted about 160 feet from the stage and had a great image. One thing you will need is a DVR to be able to control the zoom and other settings in the camera. Other then needing a DVR, the camera seams to be sold.